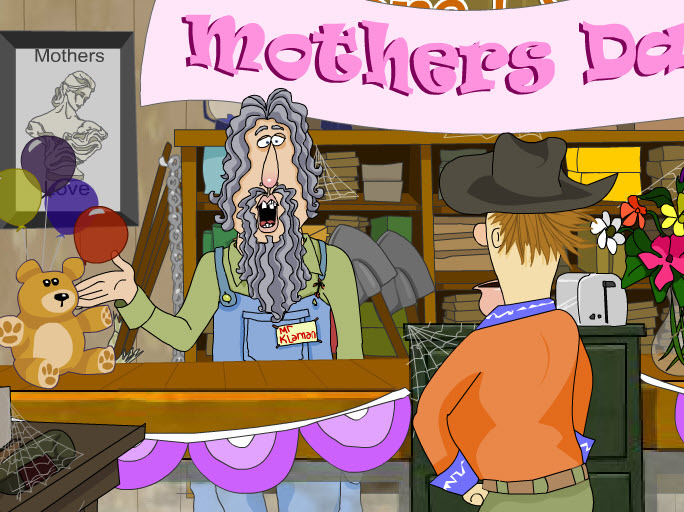 Mother's Day - "The Geeks"
Mother's Day - "Food Eaters"
Mother's Day (painterly) - "Sweet Chicken"
Mother's Day - "Selma Golfarb"
Mother's Day - "Madam President"
Mother's Day (18 and over) - "Housewives of Needles, Ca"
Mother's Day - "Master Liu"
Mother's Day #2 - "Rube Goldberg"
Mother's Day - "Rufus the Dog"
Mother's Day - "Taco Truck"
Mother's Day #2 - "God"
Mother's Day #2 - "Psychick"
Mother's Day - "Dottie Rat"
Mother's Day #2 - "Louise the Angel"
Mother's Day - "On the Runway"
Mother's Day #2 - "Roadshow"
Mother's Day - "Rube Goldberg Inspired"
Mother's Day - "Donner and Blitzen"
Mother's Day - "Jack and Jacques"
Mother's Day - "Sweet Chicken"
Mother's Day - "Sinky Dog"
Mother's Day - "General Store"
Mother's Day - "Aunt Gloria"
Mother's Day - "Sister Mary Margaret"
Mother's Day - "Moon McFadden"
Mother's Day - "De la Noche"
Mother's Day - "Bats Inna Belfry"
Mother's Day - "The Minstrel"
Mother's Day - "Juicy Juice"
Mother's Day, parent to child - "Frankie and Eddie"
Mother's Day - "Ellen and Winsor"
Mother's Day (Mother to Child) - "The Mother"
Mother's Day - "Flight Attendant"
Mother's Day (in law) - "Sarah"
Mother's Day - "Way Up North"
Mother's Day - "Dah Sport"
Mother's Day - "Carlita D'Mechanic"
Mother's Day - "Woody Guppie"
Mother's Day - "The Psychick"
Mother's Day - "Frankie and Eddie"
Mother's Day "Larry the Loungeman"
Mother's Day "Bats inna Belfry"
Mother's Day "Singin' Cowboy Bob"
Mother's Day " Flashback Boys"
Don't Let Hallmark and Tele-Florists Control Mother's Day! Send OUR Mother's Day cards out, instead(have we no shame?)! Anna Jarvis was repulsed by the almost immediate exploitation of the holiday she spent her life trying to establish. Florists, greeting card and candy companies JUMPED on Mother's Day, making it second only to Christmas as the biggest holiday to move their products. Sure, we here at Rubber Chicken Cards ARE part of the vast, world-wide "eGreetings-Industrial-Complex", but the reason WE want you to send out RCC Mother's Day cards --instead of those grossly commercialized card companies cards-- is, because we KNOW our eGreetings are what your mom (and wife and grandmother) wants. We asked her, we have lunch together ALL the time. And she wants us to tell you that she's very proud of you. And then she makes us eat everything on our plate and take our elbows off the table. THAT sounds like her, right?! Mother's Day is celebrated internationally, but on different days. We wonder why we can't celebrate moms EVERY day! After all, mothers work every day and NEVER get a day off! So, let your mom and ALL the important moms in your life, know how much you appreciate their hard work, send a Rubber Chicken Mother's Day card out to them RIGHT NOW! And, we'd also like to say to you, "don't sit so close to the computer, sweetheart, it's not so good for your eyes... and are you SURE have enough clean underwear?!?" sign up for a free trial account here, to send unlimited free eCards for 10 days!